NORSKE FOLK EVENTYR (Fairy Tales), by Asbjörnsen and Moe, available at "http://www.lysator.liu.se/runeberg/folkeven/"
PEER GYNT, play by Henrik Ibsen, music by Edvard Grieg. I heard a radio concert version on CBC with the Toronto Symphony and narration by Christopher Plummer, I don't know if that concert is available on records. The cycling book (SFIN) has 2 tours in the plateau between the 2 big dales of Gudbrandsdalen and Österdalen. In the south the plateau is only about 800 m but in the north it ends with Rondane, the mountain region with peaks over 2000 m. Treeline is about 900 m. The area is famous in Norwegian history and legends. The flight of the Birkebeiner, carrying the infant Prince Håkon happened here in 1206; this was the inspiration for the famous Birkebeiner ski race. Many of the well known folk-tales take place here, including those of the legendary Per Gynt and his exploits with reindeer, trolls and budeier. The summer farms in the highlands were called seters where the budeier, daughters of the farm families, kept the livestock, made butter and cheese. There are several gravel roads going through the area. Most of them are toll roads (bomveg). Motor traffic is very light on them. Sheep and cow traffic can be quite heavy. There are several marked cycling routes. 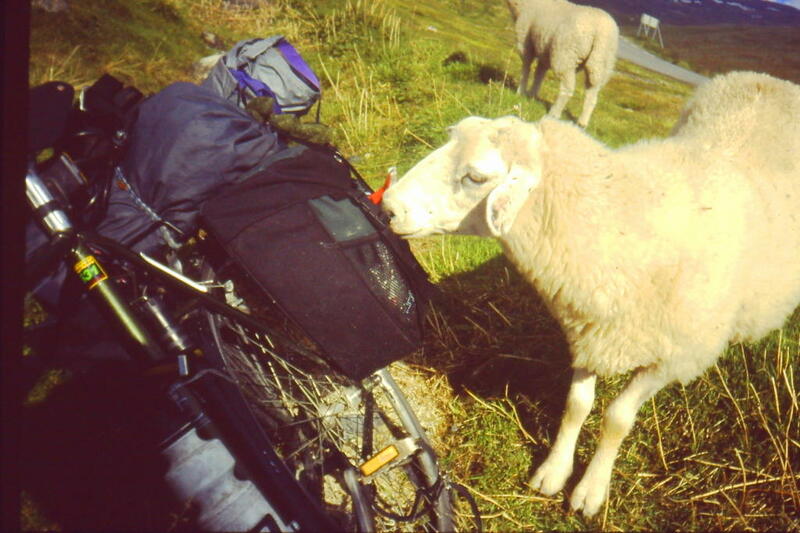 Sheep also run loose on some major roads, like Rv 250 from Lillehammer to Dokka. There are occasional cattle grates called "ferist" across the roads which must be crossed at right angles. The presence of cattle wandering on the roads actually makes for good cycling conditions. Motor-traffic tends to be slow, cautious and patient. It was partly sunny in the morning so again I had false hopes about good weather. I would probably be out in the wilderness for several days so I had to go buy groceries first. So it was quite late before I left Hamar (el 120m). I went back out to Vang again, on the cycle paths along Rv 25 to Ry then turned off at Ry to Övre Vang (300 m). I was heading for Gåsbu (520m). In March I had skied up to Gåsbu across the fields so I knew some of the area. Then I saw a road marked Ormseter Veg. I don't have my good topo map of the area but I remember Ormseter being near Gåsbu. So maybe this is a shortcut. The road turned to gravel and got very steep. Then it seemed to end at a farm. But there is a rough road heading in the right direction. I don't want to waste all the climbing so I walk my bike up through the woods. I may have skied up this path in March. Finally I come to Ormseter which is now a collection of cottages (hytter). Then it is a short ride to Gåsbu (520m). I probably only lost 30 minutes by taking the shortcut! There is a big parking lot and a cafeteria, which is closed today. There are only a few cars parked here today. This is a very popular ski area in winter, with several hundred km of trails (löypa) and a connection to a trail that goes all the way to Rondane. There is a self service tollgate (bom) here . Of course, cyclists and hikers can freely travel on these private "bomveg". There are also bicycle route signs all the way to Ringebu. I had lunch here while the sun shone. These gravel roads would be very good if it hadn't rained so much. In the dirt I could see large and small hoofprints and I was hoping to see reindeer (caribou) or elk (moose) but it was just cows and sheep. This is seter country, the upland summer pastures. Maybe there will be trolls or maybe even budeier ! I passed St Olaf (el. 620m) and it had become cloudy and cool. I stopped for lunch by a river at Bolsdalen and it started to rain. I tried to find shelter under some trees but some sheep had the same idea. One must be careful where one sits down in sheep country! The rain did stop but the roads now became rather muddy. At Kvarstadseter (670m) on the Åsta river I crossed the famous Birkebeiner trail (loype). I had skied across here in March 1995 from Rena to Lillehammer on a foggy, snowy day. Today I am wearing more clothes than in winter and feel colder! I thought the loype might be a shortcut to Sjusjöen (12km) but it was definitely not rideable. Not even walkable. One would sink up to the knees in the bog. A large part of the trail is across open bogs (myr). There is a Birkebeiner mountain bike race but it follows more solid roads. About 10 km later at Åstbru I come to a major junction of bomveg. There is a toll booth there. The choices are north-east to Messelt in Österdalen, south to Sjusjöen and Lillehammer or north-west towards Ringebu. I decided to stop for supper and camp nearby. There was a utedo (outhouse) with very artistic interior. There was a copy of the famous Birkebeiner painting and some poetry. There is a picnic table by the river. The sheep didn't bother me while I had supper. I had some whole wheat Birkebeiner bread and some Gudbrandsdal ost (sweet, brown whey cheese), but no römmegröt. One advantage of the cold weather is that the cheese keeps better. It doesn't slice very well when warm. I put up my tent in a little clearing by the river. I checked the ground carefully! One get used to the smell of sheep muck but I don't need it on my tent. The roar of Åsta lulled me to sleep. No trolls came. Sunny breaks in the morning gave be more false hopes about nice weather I had breakfast and the sheep just looked on. My chain had picked up a lot of mud so I washed and oiled it. The wet, dirt roads have worn out my brake pads and I will have to replace them. My bent rim has held up very well in the last 3 weeks and has only needed a few minor spoke tightenings. Unfortunately, the sunny breaks ended and it was misty and cold, the temperature dropping to about 5 C! Near Åstdalseter the road rises above the treeline (900m) and also above the cloud line. At Kjeiken (1000m) I stopped in the lee of some seter buildings and had lunch. No budeier here! The fog is getting thicker and it is getting colder so I'd better cut short this tour before I die of hyperthermia. I'll head down to the bottom of Gudbrandsdalen where I hope it will be warmer. If the weather improves I can come back up the mountain at Ringebu. There is a road junction with bicycle signs and I turn off on the road down to Öyer. Now I found out that Norway is a 3-dimension country. From the map it looks like it is only about 3 km to the E3 at the bottom of the dale but it is almost 1 km vertical below. Gudbrandsdalen is almost a canyon here. It is a good dirt road but the rain has made some muddy spots. My rear brake wasn't working so good so I adjusted it. I guess I didn't align the pads properly. At Oddvang I had to ride on E6. There are some sections with a bike path but most of it is a highway with heavy traffic. I've only seen about 10 cars in the last 24 hours so maybe the traffic was really light! At Tretten I crossed the river to ride the back road. I was expecting a flat road along the river, but the road joins up the farms and they are at different elevations of the western wall of the dale. There is a lot of climbing and descending. I can see that E6 is perfectly flat on the other side. It is also raining and temperature is 10 C. This might be a scenic road in nice weather but I was cold and wet. My spirits are getting low. I wished I was cycling in the Sahara desert instead. So at Fåvang I crossed over to the E6 again which is flat and the traffic didn't seem so bad. I stopped for supper at a picnic area along the highway. At Hundorp I crossed the river again. The road isn't quite as hilly and it stopped raining so it seemed nicer. I camped in wet woods. My original plan was to take Rv 27 up over Ringebufjell and then around Rondane, maybe on some more seter roads. But it would be even colder and wetter up there. Maybe tomorrow. I went down to a picnic area on the river below a power dam in Harpifoss and cooked breakfast. There were a few sunny breaks on E6 so my spirits improved. I have given up expecting summer weather. Now I try to feel happy when it doesn't rain for a few minutes or the temperature is above 10 C. At least I am learning some new words to describe the weather, by looking at the headlines on the papers on the newsstands. "Mer Mökke Vaer" says one, I wonder what that means? Just like it sounds- "More Mucky Weather", muck as in manure! Another said something like "Would the last person to leave Norway, PLEASE TURN OFF THE SHOWER!" At Vinstra I stopped at the Per Gynt museum. For a fictional character, old Per got around and left his marks. Dovregubbens Hall (Troll Kings Cave) is marked on the highway map and there is a monument in the Rondane where Per met the Boyge! In the late 1700s there was a farmer called Per (Peder) Gynt Hågå near here; Hågå is the farm name. The museum is in a house that had been moved from the farm. The girl in the museum said that the correct pronunciation of Gynt is with a "soft G", like "Yes" in English. The 2 "Es" in Peer is Henrik Ibsens invention. The first written account of Per's tales is in Asbjörnsen and Moe's "Norske Folk Eventyr". I changed the brake pads on my front brake. The sand and rain has worn them down and I expect more steep hills. I should have checked the rear brake! The back road to Sjoa is quite nice, especially when it isn't raining. There is a suspended footbridge across the river. I walked my bike half way across to get some pictures. I saw some river rafters. These were on little rubber rafts and they had wet suits and swim flippers. There are lots of river rafters in the area, but mostly on the side rivers, Otta and Sjoa. These people were paying money to be wet and cold! I'm wet and cold for free! The backroad on the west side of the river continues to be nice all the way to Otta, but then it started to rain. Then I join up with my 1994 route. This was the northern point of my 1994 trip, when I had to take a train to Oslo. That day it was sunny and hot! This is supposed to be the driest area of Norway, in the rain shadow of Jotunheimen. I was in the sports shop to buy a new butane fuel bottle for my stove. I should have bought something else, but I didn't know that yet. I also forgot to use the bank machine. Heavy rain kept me in town until 1500. I headed out of the west side of the river on a nice back road. I was hoping to get to Dombås. When I got to Nord Sel it started to rain again and it didn't look any better ahead. It was 33 km to Dombås. My original plan was to continue north to Åndalsnes, then come south on Trollstigvegen but I probably didn't have time for that anyways. So I gave up that plan and headed back to Otta. I also didn't want to spend another night in the wet woods so I was heading for the hostel at Sjoa. Back through Otta, I forgot to go to the bank. I continued back to Sjoa. I had passed the hostel about 5 hours ago. The hostel was full. I guess this is a high tourist area; a lot of people come here for the river rafting. There was a big tour bus from eastern Europe. The manager gave me the name of a guest house along E6 about 5 km away. I didn't have much hope but when I got there they had empty rooms. It was only 150 Kr for a private room, including breakfast, no more expensive than the hostel. They also had cabins to rent which would be a bargain for 2 or 3 people. Finally I'm going to have a dry night. There were several groups of river rafters here. I cooked my supper on a picnic table outside. It had stopped raining and I even warmed up in a brief patch on sunshine. I had a nice buffet breakfast before the big groups of rafters came in to the dining room. I had checked my rear wheel several times since the start of the trip when it was bent on the plane flight. It had stayed quite true. But this morning I thought to try to make it even better. Then I noticed cracks in the rim around the spokes! To straighten the rim I had put too much tension on some of the spokes. So I don't dare touch the spoke tension now. I also should have checked my rear tire more closely. My other problem was that there would be no banks along the route, Rv 257 and 51 so I'd better go back to Otta again. It was only about 10 km along E6 which had bike paths and shoulders. I used the bank machine in Otta but decided try my luck with my cracked rim so I didn't go to the bike shop. It was a nice ride along the south side of the Otta river (on Fv 436-Baksidevegen) and there was even some sun-shine so I forgot about my wheel problems. I passed a dam and then just a little ways above it, a bunch of river rafters. I wonder if they know about the dam? At Lalm I had to wait a few minutes for some cows to get off the road. 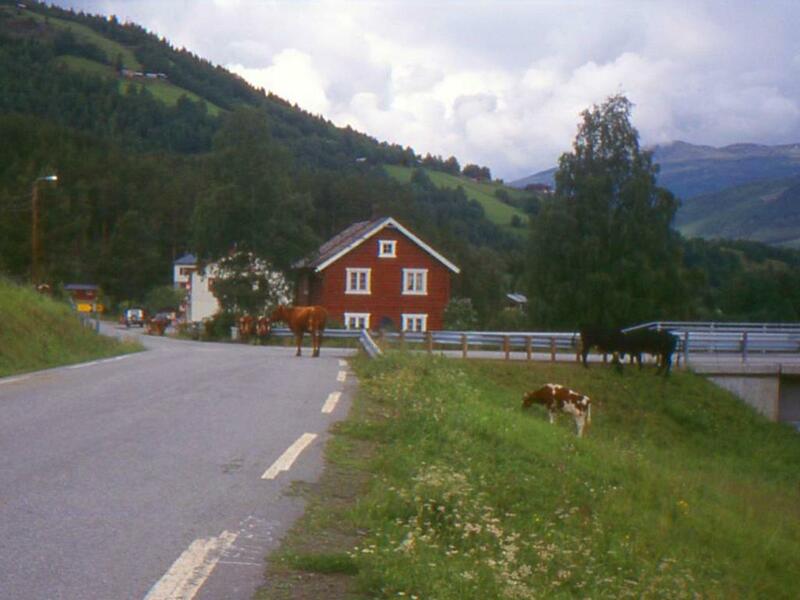 (photo of Lalm cows) I was about to turn off on the road (Fv 456) up to Heidal when I heard a swish-swish from my rear wheel. I looked and saw a large rupture in the tire, the tube was sticking out! My brake pads had been rubbing against the tire and worn a hole in the sidewall. So I have a rim that may disintegrate and a ruptured tire! What else can go wrong? My spirits were at another low. There's the bike shop back in Otta. But first I have to make the bike ridable. I put my good tire on the rear and put a rubber patch boot on the rupture. Then I put a few layers of packing filament tape inside over the boot. It seems to work. I push my luck and decide not to go back to Otta. The next bike shop should be in Fagerness. After the repairs I was hungry so I had lunch in Lalm, there was a small country grocery store at the corner. I was browing through scanned (from 35 mm slides) photos of this trip, and noticed the above photo of the cows at the Lalm crossroads. In the background there is the small country store (white building). I checked the recent GoogleMaps Streetview, and it follows Fv 436 past the small store. I zoomed in on the store and SURPRISE- it is no longer a grocery store -it is a very good BICYCLE SHOP JT SYKKEL, owned by a JT Mikalsen, who has cycled the Trondheim-Oslo "cyclosportive" ride about 20 times. So next time I have bike trouble in Lalm, I'll know where to go! Then I start up on the gravel road (Fv 456) through Heidalskogen. "Once upon a time, in these woods, there lived three giant trolls with only one eye ..."; but that's another story. You'll have to read Asbjörnsen and Moe's "Norske Folkeventyr" for that one. (The 2 Small Boys Meet The Trolls in Heidalskogen). The road climbs in several hairpins and reached 700 m. I made it out of the woods and onto pavement without being attacked by the trolls. The sun was out as I descended into pretty Heidal. Hay was drying out in the sun on the long hay fences (hesje), as it had for hundreds of summers. There are a lot of well preserved wood houses which are the scenes for some more fairy-tales. The word "eventyr" means both "fairy- tale" or adventure. When you explore these little dales you do get the feeling that your adventures are part of a fairy-tale. I lost about 250 m of my gained altitude when I got to the junction of Fv 257 at Bjölstad then it's another 250 m climb again. I had a second lunch along the road. Then I descended to 600 m again. I know I must climb to 1000 m today so I regret any losses in altitude. The sunny weather was brief and some cold rain was falling as I got to the junction of Rv 51 at Randsverk. I took shelter under a little roof. The rain was coming down hard. There was a cafe here, I could use a hot drink, but the sign said "stengt for selskap". Closed for party. It was quite a fancy dress party, too. I pulled out my stove and made some coffee. Then 2 Norwegian cyclists came by to check the cafe. They weren't more than 14 years old. I saw quite a few fairly young cyclists touring alone. They could already speak better English than I could Norwegian. They continued on in the rain. I stayed under the roof. There were some sunny breaks as I climbed steadily up Sjodalen. To the west lies Jotunheimen, the Giants Home. It cleared up enough to see the high snow covered mountains. Actually there had been little snow last winter so most of the hills were bare. I'm approaching the tree line again at about 1000 m. Numerous waterfalls pour over the cliffs. I passed the 2 young Norwegians who had ridden in the rain. They said they might stay in a hut tonight. Due to a bylaw in Vågå Kommune, camping is not allowed within 100 m of this highway so I was looking for some side road or path off of it. But at the Gjendesheim junction there was a commercial campground that had hot showers and a kitchen building so I paid 100 Kr for that. I wanted to be fairly close to Gjendesheim for tomorrow's hike. It rained when I was having supper in the kitchen. I talked to a Dutch family who had maps and info about the hikes. They were planning to take the boat on the lake to Memurubu and walk back, which is what most people do. Gjende (985 m) is a lake about 20 km long in the Jotunheim Mountains. there are peaks above 2000 m around. There are boats running to Memurubu and Gjendebu. The most impressive side is the "knife-edge" of Besseggen (1600m) between Gjende and Bessavatn( 1300m). Here Per Gynt claimed to ride a reindeer which jumped off the cliff. Har du sett den Gjende eggen noen gang ? Have you ever seen that mountain ridge at Gjende? It was mostly sunny this morning. I had breakfast in the kitchen, packed up, and rode the 2.5 km to Gjendesheim (1000m) on the east end of Gjende. There was already quite a lot of people there. There were a lot of tour-buses but they weren't the if-its-Wednesday-this-must-be Norway crowd. From their outfits you could tell that these were serious hill walkers. Most people were taking the boat down the lake and walking back. I decided to walk up the Besseggen trail for 2 hours and then turn back. The trail starts out very steep and soon is above the tree-line. The vegetation is quite fragile and there are signs not to walk off the trail. Most trails in the Norway are marked with a red T by Den Norsk Turistforeningen (DNT). In some places the trail goes up the face of cliffs and is almost requires rock-climbing skills. Norwegians consider it a casual walk! Although it continued sunny I could see dark clouds and showers coming my way. I pushed on, trying to get to the top while it was dry. Vegetation shrunk from grasses and moss to lichens to nothing at all near the top. Normally, at this time of year, hills this high would be covered in snow but there are only a few snow patches. There was false summit with a 100 m drop, then I finally got to a large cairn marking the top at 1743 m. There is no warming hut here! So I just sat down in the lee of the cairn. The clouds came over me so I put on my rain suit over a down vest. But it didn't rain. It snowed, quite thickly! But it was less unpleasant than rain. I was warm and dry wearing 4 layers. So I sat down and had lunch. I could hear several languages, including English, from passing hikers. After lunch and the snow cleared I decided to go down to the "knife- edge" between the 2 waters Gjende and Bessvatn, 1300 alens below (alen == 62 cm). There was some ice on Bessvatn. I didn't see a reindeer to ride. Of course, Per's deer fell off the cliff here! I wanted to take a slower way down than that! So I went back up to the summit, had another snack and started down. I met a bunch of teenagers from an school in England and talked to some of the teachers. They were on a 2 day hike. The walk down is harder the climb. I carefully stepped through the boulders, trying not to wreck my knees or sprain an ankle. The cliffs were very tricky. Some of the rocks were wet and slippery. I was still wearing 4 layers, including rain suit. Then I was passed by 3 attractive Norwegian women, wearing shorts and carrying fairly big rucksacks. They were running down the mountain, leaping from boulder to boulder! I was back at Gjendesheim by 1500. I had lunch and a cup of coffee and bought a few souvenirs. Now I have an "easy" 400 m climb on bike up to Valdresflya which is one of the highest highway passes in Norway. There are threatening clouds but I stay dry. There are tame reindeer herds in the area. I didn't see any. Valdresflya Vandrerhjem (1400m ) is the highest hostel in Norway. For electricity they have a diesel generator which is only on for a few hours a day. There is no guest kitchen so I cook supper outside. Then I go to the cafeteria and order a bowl of römmegröt, a specialty of the region. It's a porridge (gröt = grits, groats) with sour cream and cinnamon. I had the usual buffet breakfast in the dining room. I had read about a boat which goes down the length of Lake Bygdin and it looked like a good option on the way to Fillefjell. At 1050 m altitude it is one of the highest boat services in Europe. "Finnes det en båt på Bygdin?" "Nei, desverre. Båten ikke går. .... lite vatn"
She said something about little water, I wonder what that means. No boat ride, but I should go to Fagerness to find a bike shop for a new tire. It was really cold (just above freezing) and wet on the ride downhill to the lake. I was wearing all my clothes. Too bad I didn't get a better view of the peaks, but I did see Bitahorn (1680m). At the lake I saw what was meant by little water. The lake was practically empty! The boat was sitting on dry land! There were several cars parked, other people must be waiting for the boat too! A couple from Belgium invited me into their van and gave me some hot coffee. They were expecting to meet friends here. I got down below the treeline and the sun came out. That feels better. There were some bike paths coming into Beitostölen, a mountain resort and there was a grocery store and a sports shop here. Maybe they have tires. Although they sold mostly mountain bikes ( 26 in. size tire), 700 x 35 C (ISO-35-622) is a common size on commuter bikes so I got a brand-X tire for only 90 Kr (about $18). It was actually a little wider, 700 x 37C. It hurt me to discard that $40 Avocet with only 3000 km on it, they usually last for 10000km. I should check my brake pad adjustments more! Now I feel better about riding on rough roads. Now I don't have to go all the way to Fagerness so about 8 km south I take a shortcut over a nice sideroad which climbed back up to near the treeline at 1000m. But then it started to rain again and I was cold. There was a cafe behind the silversmith museum, but the sign said "closed Mondays, you can get ice-cream in the museum" I didn't feel like ice-cream, and the museum didn't open until 1300. But the sun came out again and I had lunch in a clearing. I didn't want to lose altitude by going down to E16 on the bottom of the dale, so I took a parallel road along the hillside. This is really nice, passing by the stav kirk of Höre (no tour busses!). There are nice views of the dale below, of the long hay-drying fences (hesjer). There are even lilacs still in blossom. To the north are high mountains of Slettefjell. A large waterfall spreads down the hillside. Traffic is almost none, except for cows and sheep. After another rainshower I was chilly. There was a little kiosk selling refreshments. I want something hot. So I asked the young boy. "Nei, men vi har iskrem." Icecream! They must think it is July! Oh, it is, I almost forget. Some local kids cycled up and got some icecream (BRRR). I pulled out my stove and made some coffee. The road was gravel and was soft in places after I met a road grader spreading fresh gravel. Finally I had to descend down to lake Vangsmjösa (466 m). This is a nice paved road along the north side of the lake, E16 is on the other side. There is a narrow stretch of fields but then cliffs rise over 1000 m to Vennisfjell (1777 m). Numerous waterfalls plunge down the cliffs. There are several rocks the size of houses that look like they have fallen recently. The roads winds between 2 of them, I hope no more are falling today . Along the lake there was a beach and I saw some girls, wearing bathing suits, trying to sun themselves. They must think it is July too! Near the west end of the lake a full size Viking ship is anchored! At Öye I join E16 but it has fairly light traffic. There is now a gradual climb to the junction of Rv 53. This is where I would have come in if I had taken the boat on Bygdin. Some rainshowers happen but stop by the time I reach the top of Fillefjell (1013 m) at about 1815. For a while it is flat, but then there is a long, fast downhill to Borlaug (500 m) at the junction of Rv 52, where I had come down 2 years ago. It was 1945 but the hostel had lots of room. The sun came out and I had supper outside with the sound of waterfalls. This was a long memorable day, I even had about 2 hours of sunshine. In the morning it was sunny but that it probably won't last long so I listened to my radio for a weather forecast. It was difficult to make out the words but I'm sure I heard the words "pent vaer" - fine weather! It's a gradual downhill but a headwind slowed me down. I had been over this section 2 years ago but it was nice to do it again. Again I walked a bit up the old Vindhellveg road with its stone posts. Then I rode to the famous Borgund Stavkirke. At about 10 AM there were 4 tour buses (if it's Tuesday this must be Norway) with swarms of tourists in the parking lot taking pictures, most had video- cameras. But I think I got a better picture. I walked up the trail through the pasture behind the church where there is more panoramic view. This next section is one of my favorites anywhere, even the second time. The road goes through a few narrow canyons along the raging river. There are many waterfalls coming over the cliffs. I'm glad the water isn't falling out of the sky, on me! The road is narrow with a few short tunnels but traffic is light. This a famous salmon river, there is a "wild salmon" museum in Laerdal. The town of Laerdalsöyri looks like a museum with nice wood houses and "koselig" streets. It is on a branch of Sognefjord, the longest fjord in Norway. I went to a little square in town by the tourist bureau and town hall and had lunch. I had a talk with a 75 year old minister who had come out of retirement to perform a wedding in the famous Borgund church. Traditional Norwegian music was coming out of a store next door so I went in. I asked the clerk about a CD of Musical Souvenirs of Norway. He described all the songs and played samples -some Grieg, Holmenkoll March, some Syssel Kyrkjebö, etc. I probably could get it cheaper at the Duty Free Shop at Oslo airport but I wouldn't get service like this so I bought it. I don't have a portable CD player so I have to wait til home to hear it. I was down to the end of my last (5th) roll of film so I bought a roll of 36 - I should have bought 2. Now that the weather is improving I'm taking more pictures. I took over 300 slides on this trip. The ferry situation here has changed since 2 years ago. The ferry from Revnes to Kaupanger doesn't run, so I couldn't do the route I did 2 years ago. Some new highway tunnels - one 10 km long have been built. I'm not sure how cyclists can get across to the north side of Sognefjord. I didn't ask further since I wasn't going that way. Finally at 1400 I started climbing up the "snow road" in bright sunshine. I had this strange feeling of HEAT. For the first time in weeks I was wearing shorts and short sleeves. It would be better coming down this side since it is a long straight section. The road is only one lane wide. I kept going with only a few photo stops. I wanted to reach the half way point, at elevation 650 m before a major rest. I had a snack while some cows wandered freely by. There are ferists (cattle grates) at places across the road so one must cross those at right angles. Higher up sheep take over from cows. There are a few switchbacks up to the treeline at 1000m, then It is a gradual climb across the vidda (tundra). Across on a barren hillside I can see a small green field and some seter buildings. There are only a few snow drifts along the road. There are several small lakes with some ice left. There are 2 summits at Hornshytta at about 1300 m. At the top of the second summit it has clouded over and got cold. It is raining but only on me! In every direction there is blue sky. Down below I see a meadow in the sunshine, it looks like a good spot for a lunch. By the time I'm down there, it's raining there but sunny everywhere else. I left my rainsuit on over sweatpants and sweater since I expected it to start raining again, and thought it would be a cold descent. Of course it became sunny and very warm. Then I got back to the treeline and back civilization. I can see Aurlands fjord about 1 km away, straight down that is! There are many hairpin turns on a very narrow road. There was some on-coming traffic including some travel trailers, which take the whole road. I didn't think that trailers are allowed on this road. It would be much nicer climbing this side on the hairpin turns. Anywhere else this would be called a cliff but here it is vertical farm fields! Farmers are cutting hay with scythes, and hanging it on long hesjer. The fjord today looks like the typical Norway travel poster- blue sky, snow capped mountains, green meadows, blue-green water with a few big cruise ships. By the time I got down to sea level it was very hot. I was still wearing winter clothes while I saw some girls riding in bathing suits. There are a lot of people in Aurland. New tunnels on Rv 50 have brought in masses of traffic to this fjord. Ferry service has been reduced. Fortunately there are cycle paths and old roads for most of the 8 km to Flåm. There are a lot of people in Flåm too. The hostel is at a campground and with all the people here I was not surprised that it was full. I decided to camp in the campground for 40 kr, rather than in the utmark for free. There were hot showers etc. here. This has been the nicest day in over 2 weeks, with warm temperatures and only a few minutes of rain. I hope this weather continues since I am about to start the biggest goal of my trip - Rallarvegen.